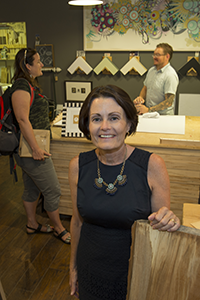 Mary Miller, president and CEO of the Downtown Nor­­­­folk Council, wants the Granby Street area of downtown Norfolk to be a business showplace. In May, the group partnered with the digital marketing firm Grow to begin Vibrant Spaces, a program designed to increase the number of street-level businesses in the area. The growth of Norfolk’s downtown residential population is one catalyst for the program. “That gives you the base and critical mass to support these new businesses,” Miller says. The council came up with the project after receiving input from people who live, work and own businesses downtown. The area already has a growing number of independent restaurants. “We knew we had the opportunity for more retail,” Miller says. The group’s wish list includes a grocery store or urban market, bakery, farmers market, brewery, bike shop, wine shop, homemade ice-cream parlor, 24-hour diner, live music venue and art-supply, pet-supply and home décor stores. Phase I of the program will offer six available downtown spaces to new businesses. They will be able to lease spaces at 50 percent of market rate for two years and 75 percent of market rate for the third year. Business owners also will have access to $20,000 kick-start grants ($10,000 on opening and $10,000 at the one-year anniversary). In another facet of the program, existing downtown businesses can apply for a share of $60,000 in matching grants to be used in making their businesses more attractive. The successful applicants will receive funds equal to up to 50 percent of the cost of their enhancement projects, or up to $10,000 per business. Businesses will be notified by early August on whether they have been accepted as a program participant.